Santa Anita Canyon is one of the most beautiful areas of the San Gabriels, full of varied landscapes and a dependable 50 foot waterfall – Sturtevant Falls – which doesn’t take all that long to get to. The landscape is populated by turn-of-the-century Forest Service canyons, a few campgrounds, and an old outdoor resort. It’s also pretty close to the L.A. basin sprawl, which means the main area in this canyon is also capital c Crowded. Every single time I’ve come here, no matter what day, no matter the weather, no matter what time – the parking lot at the trailhead is packed solid. But don’t be discouraged or scared away. You can park in the lot or along Santa Anita Road on the way in with an Adventure Pass, or you can pay ten bucks at the Pack Station / General Store and use their dirt lot. In 2016, the Forest Service and several transportation agencies did run a pilot program that operated free shuttles from the Metro Gold Line stop in Arcadia for a month. From all accounts, the program was a huge success — and ballot measures that could provide funding both passed in late 2016. However, as of summer the following year — arguably the busiest season in Santa Anita Canyon — no revival of the shuttle program has materialized. We strongly recommend you get to the trailhead as early as humanly possible to avoid the parking nightmare here. Parking along the winding canyon road can be more than enough to ruin your hiking trip — and notoriously spotty signage may result in a hefty parking ticket from L.A. County Sheriffs if you aren’t hyper-vigilant. From the parking lot at Chantry Flat, head south to the trailhead, which follows a narrow paved road down a sharp decline. It descends 325 feet on hard pavement, without shade. It’s not necessarily the most pleasant way to begin or end a hike, but it’s the fastest way down – so what are ya gonna do? If you’re interested in getting off the pavement as quickly as possible – and don’t mind adding a little bit of distance to your total trek, you can hop on the Hermit Falls Trail at the 0.3 mile mark. This will take you down to the creek bed, where you can either add on a little bit more boulder-hopping to re-join up with this hike, or take a side trip to the tiered Hermit Falls – a great spot for swimming and pool-jumping. If you don’t mind a tiny bit of added distance, it’s also a nicer way to reach the bottom of Santa Anita Canyon. But for the purposes of this description, stick to the pavement. The road winds and switchbacks its way down into Santa Anita Canyon, where it eventually turns into a more narrow road, then a dirt road, then a more traditional dirt trail. On the descent, you’ll hear the sound of falling water. If you like that sound (and you should), be happy – because you’ll be hearing a lot of it for the rest of the hike. After the floods of ’38, a series of concrete flood control dams were built over much of the canyon watershed near Los Angeles. Over time, the dams have become overgrown with greenery and moss, so they’re not nearly as intrusive as you’d imagine a large concrete dam to be in the middle of the forest. As the trail continues, it crosses a short bridge over Winter Creek at 0.4 mile and reaches a junction with the Winter Creek Trails and the First Water Trail (which is where you’ll pop out if you took the Hermit Falls detour) at 0.7 mile. From here, continue north on the Gabrielino Trail. You’ll skirt alongside the roaring (at least, in the wet season) creek and quickly come upon the first of the many rustic Forest Service cabins you’ll see along the route. There are 80 cabins scattered along the creeks, built between 1907 and 1936. Each of the cabins were built by their individual owners, and definitely display their unique styles. No two cabins are the same — and while some are definitely more … um, rustic … than others, I wouldn’t mind spending time in any of ’em. Some other hikers have criticized this trail for not ever feeling like a wilderness — and that’s a fair criticism — especially for these early parts of the trail where most of the crowds are congregated. But smelling the cabins’ campfires on the weekends, or watching a few cabin-dwellers work on their labors of love outside really gives the impression of hiking through one of the old mountain resorts that used to dot these landscapes. It’s an experience that’s rarely duplicated near Los Angeles and should definitely be appreciated. The trail continues through a few small “villages” of these cabins before splitting away from the water and heading into the ridge above the creek. At 1.5 miles, keep right at a cabin called “Fiddlers’ Crossing.” This trail will cross the creek three times — which can be a bit tricky if the water’s running high — cut through some ivy-covered landscapes, and take you to the base of Sturtevant Falls at 1.7 miles. Sturtevant Falls is a beautiful, cascading 50 foot tall waterfall, filled with that trademark icy San Gabriel water. The falls empty into a shallow pool, surrounded by sycamores and some boulders. Like I said, it’s freezing, but you can wade in and dunk yourself in the water if you’re in the mood. If it’s hot out, expect there to be a sizable crowd at the foot of the falls. It’s a very popular spot, but it’s definitely worth the trip. If you’re looking to escape the throngs near the foot of the falls, backtrack to Fiddlers’ Crossing where the Gabrielino Trail heads away from the water — about 2 miles if you’re following the trail (Note: there is a steep use trail climbing up loose dirt from the base of the falls to the trail above it – do not use this trail. It is not an official route. Not only is it unnecessarily dangerous for hikers, but it also dramatically increases erosion on the official trails and will make it more likely the official trail will have to be closed at some point for repairs). Here, the trail splits into the Upper and Lower Gabrielino. The Upper Trail has a more gradual ascent, but is also the route for equestrians in the area — so you’ll probably run into some trail presents along the way. More importantly, the Upper Trail misses some of the best scenery in the entire canyon. So skip it and head on the Lower Trail instead. This section of the trail is single-track, and will probably be much more secluded than anything you’ve hiked so far. Most people who hike along the creek are just headed to the Falls and back, so you’ll have a bit more private time as the trail ascends a steep ridge that overlooks the section of the creek you just hopped through. Eventually, you’ll get yourself a nice semi-aerial view of the falls, too. The trail then wraps around the southern edge of the waterfall and leads right to the top of the falls, themselves at 2.3 miles. You can get yourself some dizzying straight-down views, overlooking the cascading water beneath you. Also, you can look really cool to the people at the bottom of the falls, who probably won’t know how you got up there. Here’s a view of some fellow hikers resting to the right of the big drop. From here, the trail landscape changes. You’re no longer hiking along a broad, boulder-strewn creek — but now you’re walking on a jagged path cut into the rock, while the water beside you roars through narrow cascades. The sounds are peaceful, the trail is shaded by trees, and the air is cooled by the mist from the creek. It’s an incredible section of trail, so take the time to enjoy it — or stake a claim on one of the stream-side boulders and have a snack. The creek eventually widens out again, and the roar of the cascades returns to the gentle bubbling of gentler water — although you’ll probably still hear some distant falling water from the scattered flood control dams throughout the canyons. The trail climbs away from the creek for a bit, and winds through some smaller side canyons that are absolutely covered with ivy, which further softens the sounds of the running water. If you want some scenery that says, “I am not in Los Angeles,” this is where you want to be. The Upper trail eventually meets back up with the Lower Gabrielino Trail at Falling Sign Junction at 2.8 miles. Hang a right at the junction and continue on toward the Spruce Grove Campground. This is the longest stretch of the trail so far that’s not within earshot of running water. But this dry section of the trail is short lived — soon after getting a few good views of the surrounding peaks through some breaks in the forest canopy, the trail meets back up again with the water and follows alongside it again, stopping only for a few shallow crossings. You’ll pass the small Cascade Picnic Area at 3.3 miles, which is really just a single table and an outhouse next to another flood control dam. Not that much to look at, but a quiet place to stop for a break if you’d like. The trail continues along the creekside through dense, cool forest until it reaches the rather expansive Spruce Grove trail camp at about the 4 mile mark. While still technically a trail camp, this is one of the more developed backcountry campgrounds I’ve seen in the San Gabriels. Lots of fire pits, stoves, tables, and even a pair of vault toilets. When I walked through, there was a large group of hikers sitting and eating their lunches at the tables. It didn’t look like any of them had backpacking gear, so I’m guessing they were either a hiking group out for the day or a group coming back from Sturtevant Camp, which is just a few minutes further along the creek. I’m a sucker for camping next to water, so I may have to head back up here with a tent sometime soon. Just after the Spruce Grove Campground, the Gabrielino Trail continues deeper into the San Gabriels, toward the West Fork and De Vore Campgrounds. Instead, stay on the Sturtevant Trail, which you’ll only be on for about an eighth of a mile. You’ll pass near the entrance to Sturtevant Camp, the last remaining working camp from L.A.’s “Golden Age of Hiking.” It’s a fully functioning backcountry resort, and has a handbuilt log U.S. Forest Ranger station that’s the oldest surviving one in the country (built 1903) still in its original location. The camp was owned by the Methodist Church for years, although the good folks at Adams Pack Station raised the funds to purchase the area in 2015. In the future, they plan to restore and renovate the cabins and hold events in this incredible historic location. You can use their web site to reserve a cabin ahead of time. You can also walk into the camp to look around if you’d like. If a staff member is working (something the Pack Station hopes to improve), you can also tour some of the historic buildings at the camp. If they’re not around, you can still take a ride on the Big Swing! Continue along the Sturtevant Trail as it skirts along the flood control dam and crosses the creek. At the junction with the Upper Zion Trail, hop onto the Upper Zion and say goodbye to the water and cool canyon breezes. This section of the trip crawls up the north side of the Mount Zion ridge, passing through a short section of Jeffrey Pines before getting back to that all-too-familiar low San Gabriel scrub. This section of the trail has its fair share of history, too. This was the original route of the trail to Sturtevant Camp, built in 1896 by Wilbur Sturtevant himself (and, one assumes, some helpers). After a series of fires and landslides in the 1950s, the trail fell out of use until the Sierra Club and volunteers from the Big Santa Anita Gang rebuilt the route in 1985. There is a small plaque dedicated to these volunteers at a short spur trail that leads to the peak of Mount Zion at 5.2 miles. The summit itself isn’t much to write home about, and the trail that leads to it has sections that are heavily eroded, but the trail is so short and you’ve already come so far that it’s worth the tiny side trip. The summit is surrounded by high chaparral, but you can make out the surrounding landscape of Mount Wilson and get a nice view of the entire Santa Anita Canyon at 5.3 miles. Go back to the Mount Zion trail, and follow the trail as it switchbacks down the south face of the mountain. This section of the trail is a bit steep, and shade is scarce. But if you’re coming this way, it’s all downhill, so you probably won’t even notice unless it’s a sweltering summer day. If that’s the case, worry not. It’s only one and a quarter miles to Hoagee’s Camp at 6.8 miles, the former site of another group of riverside cabins, destroyed by fire in 1953. 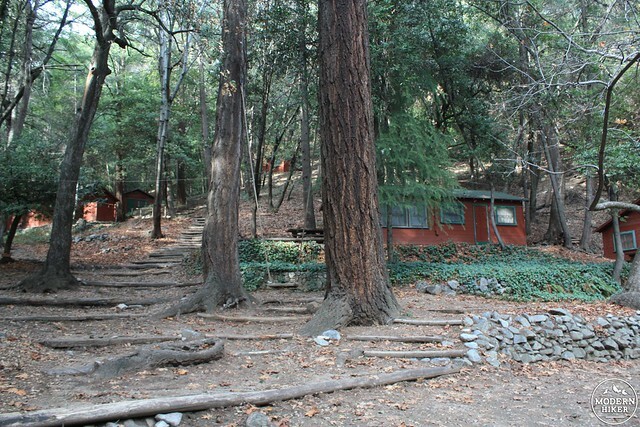 It is now another well-maintained trail camp, with a few of the old foundations and chimneys of the cabins still surviving. 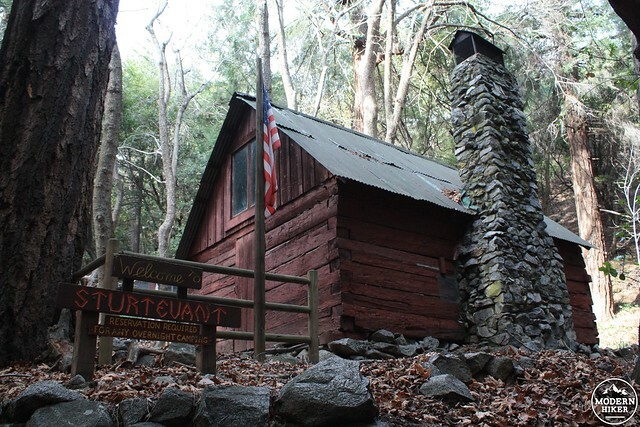 If you want, you can skip Hoagee’s and continue back to Chantry Flat on the Upper Winter Creek Trailhead. You’ll be on the trail for one extra mile, and you won’t get any more views of the river, but if you want to avoid climbing back up that steep paved incline at the beginning of the hike, that’s the route to take. The Lower Winter Creek Trail, however, is far more picturesque, and has the added benefit of being next to the water for the entire time. If you take this route, you’ll pass a few more cabins, cross the water about another half-dozen times, and hike for just 2 miles before getting back to the Chantry Flat trailhead. When you’re done, be sure to stop by Adams’ Pack Station for some good food and conversation. The weekend barbecues are super tasty! Very good. This is a well-traveled and well-maintained route, with plenty of clear trail signs. With all the "upper and lower" versions of trails, it might get confusing, but if you've got a map and know where you're going, you should be able to find your way. There are 7 walk-in sites at Spruce Grove Campground and 14 at Hoegee's Trail Camp. All are first-come, first-served. 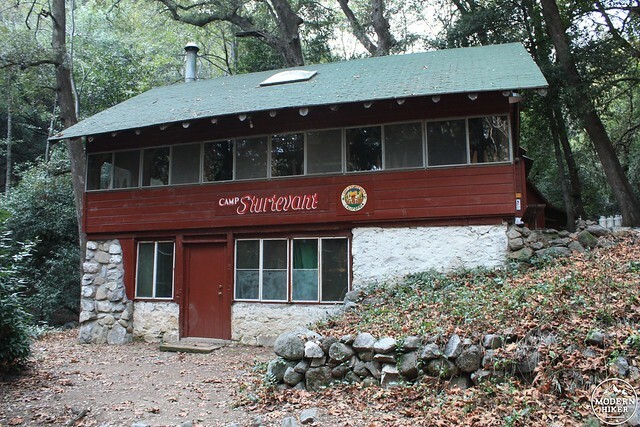 There are also sites inside the privately owned Sturtevant's Camp. For rates and availability, you'll have to contact them by phone. Take the Santa Anita exit from the 210 toward Acadia. Keep on Santa Anita Canyon Road until it ends at Chantry Flat. If you can find a parking spot here, snag it and display your Adventure Pass. The Pack Station has overflow parking for an additional fee. Get started early if you can - this is one of the most notoriously packed trailheads in Southern California, but it's worth the hassle. Parking fills up FAST. We arrived at the lot at 9:00 a.m. and were relegated to parking almost a half-mile down the hill. If you're going to do the Upper Trail loop, plan on steady, consistent elevation gain for the first half of the hike. Make sure to bring plenty of water because you'll be hustling. Also, there was one part of the hike that was slightly trepidatious. On the Upper Trail, as you are winding your way up above the waterfall, there is a very narrow path where the trail has eroded over time. It's literally only a few feet of trail, but we had to traverse it very carefully. If you're not an "advanced" hiker, take your time crossing it. Overall, we loved this hike and definitely felt a sense of accomplishment after we were done. Lots of beautiful scenery and a good workout. I would highly recommend it! I did the Upper Trail yesterday and it was a pretty good time. Less intense than I thought it would be. Once we got onto the upper trail, the amount of people we say was cut down by at least 4/5ths. Most people definitely are just shooting for the Falls, which are not to be missed. The place can get serene and some of the landscape views are incredible. I would recommend this hike. Parking wise, I just bit the bullet on this one and paid the $10 for parking. Those with adventure passes we scattered all along the road as you approach the trailhead. If you could snag one of the closer spots, do it, for those than cannot, you could be looking to add 1-2 miles each way due to how far you have out you have to walk. Just went today. Not a ton of water but a good amount considering the drought. Such a great hike. The final stretch is extremely lush and for a tint stretch feels like it could be a rainforest. I say go for it. I hiked to Hermit Falls a few days ago (Oct 24) and there was a fair amount of water. I hadn't been before, but there was water in the stream for most of my walk at the bottom of the canyon, and water in the pools and at the falls themselves. I wasn't quite brave enough to rapel down the boulders with that knotted rope (I was hiking solo-- and that looked terrifying anyways) BUT the falls sounded pretty substantial. Also, everything was quite green from the recent rain! The bottom of the canyon was really lush and gorgeous. how are the falls and stream these days? Is there much water? Been thinking of planning a hike up there soon. Hope it's the first of many more to come :) We're doing a bunch of group hikes this month - come join us! Thanks so much for this great guide (and the whole website existing and blah blah :) ! Went for my first real big-girl hike yesterday and did this trail, and it was absolutely beautiful. That's great to hear, Gloria! If you snapped any photos, you should send an update to California Fall Color so they can keep better track of SoCal! We did this hike yesterday and it was great. We did the 9 mile loop and saw some great just starting fall foliage. The waters of course were very low. We started about 630 am, so the weather was perfect and the trail wasn't crowded. Loved it ! !